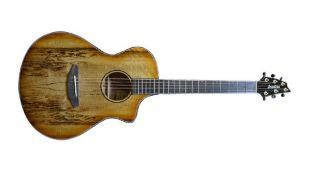 Breedlove has unveiled the Oregon Concert Prairie Burst CE, a concert-sized acoustic boasting a body constructed of locally-sourced myrtlewood and a hard rock maple neck. Other features include an ebony fretboard with offset dots, Breedlove satin gold tuners, an African ebony Delta bridge and tortoise binding. The guitar is finished in Prairie Burst Gloss and is offered with an LR Baggs EAS VTC. The Oregon Concert Prairie Burst CE is available for $2,399. For more information, head over to BreedloveMusic.com.